Orangethorpe Elementary School was established in 1949 and is located on a main street in the southwestern section of the city of Fullerton. It is border by a public park to the south with residential homes to the East and business to the North. We currently have 717 students enrolled in the school serving grades PK-6 as a Title I school. Our school community is comprised as 78% Hispanic/Latino, 8% White, 6% Asian, 8% two or more races and with 88% participating in free and reduced lunch. 44% of our students are English Learners and 24% are Reclassified as Fluent-English Proficient. Our motto of "Aim for Success", drives our committed staff who holds themselves responsible and accountable for all the students in our school. Parents are offered learning opportunities as they participate in our school wide events along side leadership opportunities such as ELAC, SSC, and PTA.We offer many workshops for parents to learn how to work with their children and make learning an enjoyable experience. We offer school program such as the after school for working parents. During school hours, we offer a Response to Intervention (RtI) program to support our students academically and behaviorally. 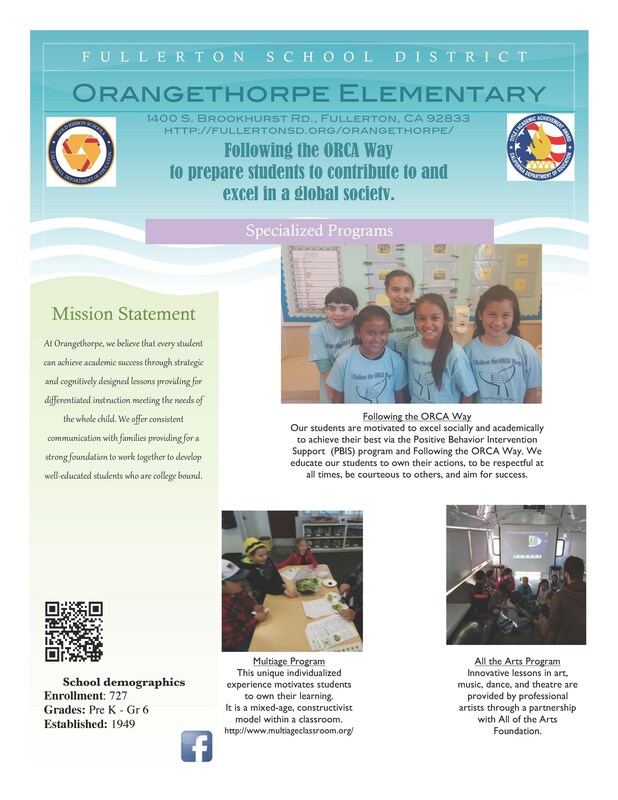 Despite their hardships in life and what they have to deal with daily, our students need to know that Orangethorpe is a safe place that will get them ahead in the world and to learn what is necessary for them to succeed. Our school community is comprised of the Orangethorpe Staff, Parents, and Community which has revised this Single Plan of Student Achievement to represent the innovative approach for assisting our students in achieving their academic and social goals through meeting the Common Core State Standards. Without the committed parents and community, our goals could not be met. The Orangethorpe staff is also committed to improving student learning by analyzing data in order to plan for the current and future needs of our students. Looking at demographics, perceptions, school processes, and student learning will enable us to make continuous school improvement.